Rings often contain atoms other than carbon. In many cases, the same basic shape of the carbocyclic compound is still adopted. For example, replacing a carbon of cyclohexane with an oxygen, as in tetrahydropyran, preserves the same basic chair shape. Figure CA12.1. 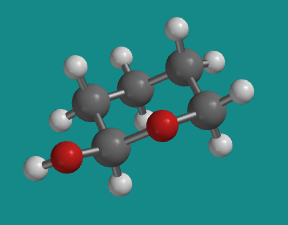 Ball-and-stick model of tetrahydropyran. Note the similarity to a cyclohexane structure. Go to Animation CA12.1. 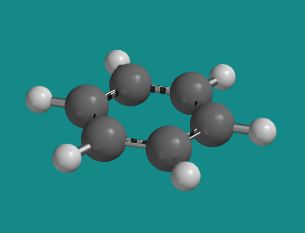 A three-dimensional model of tetrahydropyran. The tetrahydropyran structure is common in nature, showing up most frequently in the form of sugars such as glucose. Glucose has a number of different forms that exist in equilibrium. The predominant form in aqueous solution is β-D-glucopyranose. Figure CA12.2. Ball-and-stick model of β-D-glucopyranose. Note the tetrahydropyran substructure. Go to Animation CA12.2. 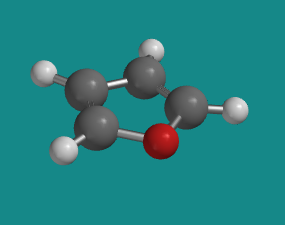 A three-dimensional model of β-D-glucopyranose. Draw β-D-glucopyranose in a chair. Label each substituent axial or equatorial. Perform a ring flip and compare steric strain in the two conformers. One of the other isomers in equilibrium with β-D-glucopyranose in solution is α-D-glucopyranose. The two isomers are almost identical to each other, except one hydroxyl group is pointing a different direction. Figure CA12.3. Ball-and-stick model of α-D-glucopyranose. Go to Animation CA12.3. 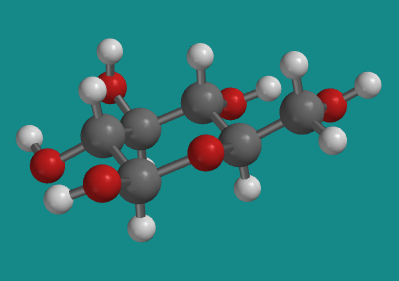 A three-dimensional model of α-D-glucopyranose. Compare steric strain in the two glocopyranose isomers. Which isomer should be the major one? We can isolate that core tetrahydropyran structure of the sugar again, bringing with it the one hydroxyl group that differs between the two glucose isomers. In one of the glucose isomers, the hydroxyl group is in an axial position, as it is in this axial conformation of 1-hydroxytetrahydropyran. Figure CA12.4. Axial conformer of 1-hydroxytetrahydropyran. Go to Animation CA12.4. A three-dimensional model of 1-hydroxytetrahydropyran. In the other glucose isomer, the hydroxy group is in an equatorial position, as it is in this equatorial conformation of 1-hydroxytetrahydropyran. Figure CA12.5.Equatorial conformer of 1-hydroxytetrahydropyran. Go to Animation CA12.5. 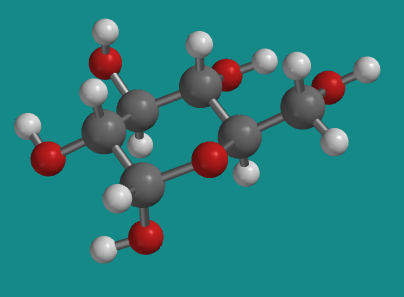 A three-dimensional model of 1-hydroxytetrahydropyran. An unusual effect is seen in cases in which an oxygen in a ring is attached to a carbon that also holds an OH group (see drawings above). This O-C-OH group is called a hemiacetal. In a six membered ring, the hemiacetal could be found in two different isomeric positions. In sugars, these are called alpha and beta positions. a) Based on steric considerations, which of these two isomers should be more stable? b) These two isomers exist in equilibrium with each other. Which isomer should be the major species present? c) In solvents of modest polarity, such as dichloromethane, a factor other than sterics actually reverses this equilibrium; the sterically disfavoured compound becomes more stable. What factor do you think is responsible for this phenomenon? d) In solvents of high polarity, such as water, the factor in question (c) becomes less important, and sterics dominate the equilibrium. Why would a highly polar environment diminish the effect discussed in part (c)? Many rings do not undergo conformational changes because they are not very flexible. Frequently these rings contain a number of double bonds; remember that rotation is not allowed around a double bond because the bond would break. For example, cyclohexane is a six-membered carbon ring that has a chair structure. It is flexible and can undergo conformational changes. Benzene is also a six-membered carbon ring, but it does not have a chair structure. It is flat and rigid. It cannot undergo conformational changes, because none of its C-C bonds can rotate. Benzene does not undergo conformational changes because of delocalized bonding around the ring. This aromatic ring is completely flat, maximizing interaction between the p bonding orbitals. Figure CA12.6. Ball-and-stick model of benzene. Go to Animation CA12.6. A three-dimensional model of benzene. Other rings also display aromatic delocalization in which heteroatoms also participate. In some cases, the heteroatom simply participates in a regular double bond. In others, the heteroatom donates a lone pair into the π system. Furan is an example in which a lone pair from the oxygen is delocalized in order to reach aromatic stability. Figure CA12.7. 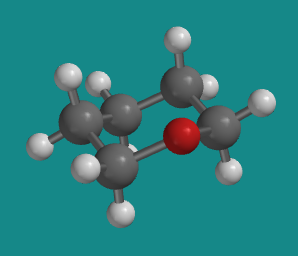 Ball-and-stick model of furan. Go to Animation CA12.7. 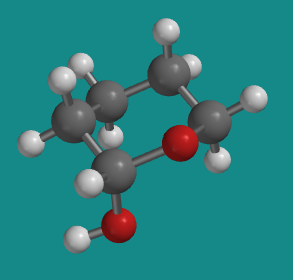 A three-dimensional model of furan. Pyridine is an example in which the ring has aromatic delocalization, but the lone pair on the nitrogen does not participate. Because the nitrogen already has a p bond, the lone pair is orthogonal to that bond, and lies in the plane of the ring. Figure CA12.8. Ball-and-stick model of pyridine. Go to Animation CA12.8. 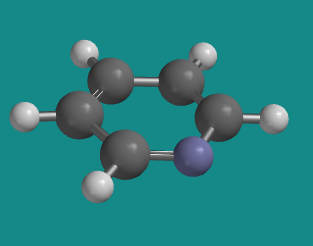 A three-dimensional model of pyridine. Structure & Reactivity in Organic, Biological and Inorganic Chemistryspan> by Chris Schaller is licensed under a Creative Commons Attribution-NonCommercial 3.0 Unported License.